MATCHES FASHION is offering an additional 20% off sale items, today only! I picked up these fur-paneled Fendi pumps, just in time for New York fashion week! This Mary Katrantzou coat is pretty rad too. Just enter code FINAL20 at checkout. Saks Fifth Avenue has brand new markdowns up to 70% off during their sale happening right now! This leopard Mara Hoffman mini and this bright pink Shoshanna dress are both on my list. Have you guys checked out Juicy Sport? It’s Juicy Couture’s new activewear collection and it is pretty darn cute. I scooped up this leopard & mesh sports bra (pictured above). Things like that make me excited to hit the gym. Click here to shop the entire collection! Love 2,4 and 11. I love the new Juicy sport collection as well it is so fun. Your edits are my favorite! Loving the new Juicy Sport line, leopard gym clothes? Yes please! Definitely have my eye on that J. Crew skirt – just waiting for a good sale! Those Essie colors are so pretty! First off – those Fendi heels, gasp! And second love pretty much anything Paul and Joe so loving those shorts. Loving that dress (12) so gorgeous and simple! And the heel on those pumps is so great! Loving this edit! Love these picks! That Gucci bag has been on my favorites list for a long time! Love it! So stunning! 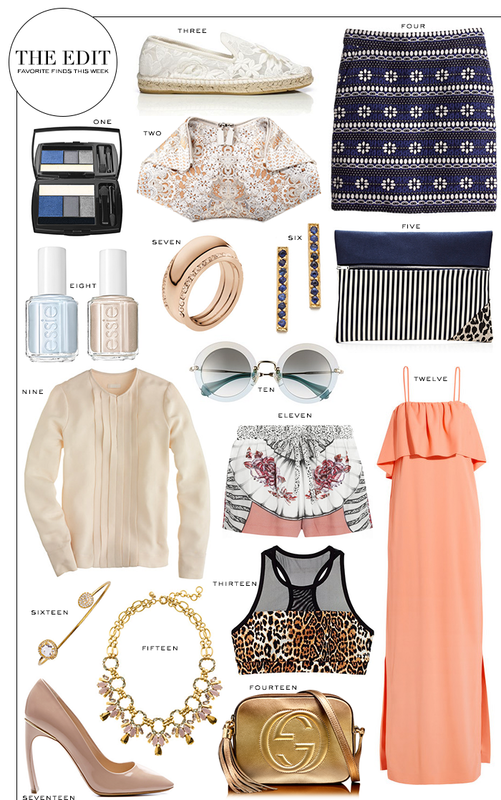 Love all your picks again…especially those shorts and those sunnies and that patterned clutch! Ohh my gosh – that dress is SOO gorgeous!! These are all great pieces. I saw the French a Connection workout gear last week and fell in love. I meant Juicy Couture. Tired. I’ve been trying to decide which color of that Gucci crossbody I want the most – really loving the gold!! Love the lace detail on the McQueen! Love this coral dress! It is my favorite color. Can’t wait for spring!! That clutch is the cutest ever! And I love the maxi dress. The leopard sports bra is AWESOME – I firmly believe in cute workout clothes. Those Fendi pumps are indeed perfect for NYFW, especially considering the forecast. Can’t wait to see all of your fab looks and live vicariously through you! Loving the J.Crew necklace and the clutch! I tried that skirt on and it’s super fun but I didn’t end up buying it because I wasn’t crazy about it on me. I’m hoping they come out with some more cute stuff! Oh my gosh, I love all of these picks!! SO pretty!!! Umm fur panel pumps? I die! Hope to see you around in NYC for NYFW lady! That j.crew skirt is my spirit animal. oh. my. god. And Juicy activewear? color me interested…. great round up! ok is that a sports bra?!?!?! I may have to change my rant on looking good while working out to rock that! I will take one of everything….especially that clutch and leopard sports bra! Can someone box that list up and deliver it to my house? K, cool. Thanks. I mean DAMN! I ADORE that Gucci bag. Ive had my eye on that style in other colors for a while, but this one is ah-mazing. Um.. can I have them all?! Thanks for sharing! Shopping time! And I am obsessed with the new Juicy Sport.. just did a post on it! Oh my goodness that Gucci bag is divine! !